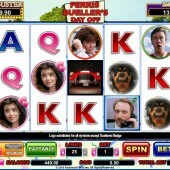 Fans of legendary ‘80s comedies – and bunking off school – will rejoice in slot developer Cryptologic’s retro movie tie-in, Ferris Bueller’s Day Off, which makes a very welcome addition to the developer’s arsenal of top-quality slots. Ferris’s mantra still rings true today, and it could be said about this slot too. There’s plenty to enjoy here so ease up on the Autoplay and savour the great details and top bonuses that you will find while playing this great little game. The game is a 5-reel, 25-payline online slot with betting starting at $0.05 a coin. For fans of the film, there are plenty of subtle references to the classic ‘80s teen comedy. Remember Ferris’s synthesizer which he hooks up to play coughs and fart noises? Those are replicated here, with a raspberry being blown whenever you change the coin size, and a cough when you change lines. Meanwhile, a fake sneeze rings out when you access the Paytable. On the reels are some great photorealistic images from the classic film: Dean Rooney, Ferris’s nemesis, Ferris’s girlfriend - Sloane Peterson - and his best buddy, the put-upon Cameron. Rooney’s secretary, Grace, the red sports car that transports our heroes across Chicago for the best day off ever, and the fierce Rottweiler which turns Rooney’s suit into a pile of rags are also here to enjoy. Some simple Q, K and Ace icons make up the reels (although, curiously, there’s no Ferris Bueller to be seen anywhere - perhaps he's having a day off from the slot altogether) and after a winning combo, a short sequence from the film will play out on the reels. The Ferris Bueller’s Day Off Logo with Ferris’s parents is the Wild and substitutes for all regular symbols other than the Scattered Save Ferris Badge. It also only appears on Reels 2, 3 and 4. The Save Ferris Button is the game's Scatter. The Fake the Parents Feature is awarded when three or more Scattered ‘Save Ferris’ badges appears anywhere on the reels. You then get to press the keys of Ferris’s synthesizer to hear the old farting and sneezing FX, and every key you press reveals a free spin amount or multiplier. After the round, watch as Rooney’s computer is ‘hacked’ into and your total spins and multipliers are awarded. The ‘Kick the Car’ bonus feature celebrates the classic moment when Cameron finally flips and takes out his anger on his Dad’s prized sports car. Get some quality Cameron time in by landing the car on Reel 2 and Cameron on Reel 4 simultaneously. Each kick sends the speedometer spiraling. The harder Cameron kicks the car, the higher the wins will be multiplied until he finally kills the car. There's Also Random Jackpots to be Won! As if revisiting one of the great John Hughes comedies wasn’t enough, there’s also a Progressive Jackpot to be won. Jackpots are awarded at random, with the size of the bet determining your chance of winning (so basically, the more you bet, the better your chances). To win the ‘Hollywood Jackpot’ you’ll have to select from a grid of film reels in order to move up the jackpot ladder. The more points you reveal, the higher up the ladder you move. This is a decent release considering it only had the platform of the movie to work with. These movie-to-slots conversions can often be very hit and miss but Cryptologic have done a fine job here. As for some other ‘80s film tie-in recommendations, why not try Footloose, the movie-themed slot based on the classic Kevin Bacon film from IGT, while Openbet offer a whole raft of 1980s-inspired video slots including the awesome Robocop slot.